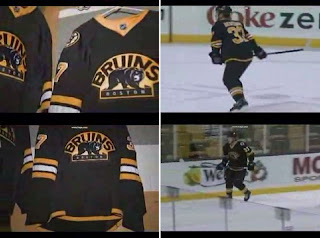 Bruins Show Third Jersey "Finalist"
I got a few emails from readers tonight regarding the NESN broadcast of the Bruins-Penguins game. Apparently, they showed what's being called a "finalist" for a third jersey to be worn, I'm assuming, next year. NESN just showed one of the "finalists" for the Bruins third jersey next year. It was a black jersey with a thin gold stripe on the very bottom of the jersey, white, black and gold stripes on the elbow. The secondary logo is the primary and the spoked "B" is the shoulder logo. While watching the Pens-Bruins game on Thursday, the Pens announcers made reference to the Bruins practicing in new jerseys that they intend to use next season. I have no photos but I thought that you could know about this. The best part is one person even sent in a mock-up of what he saw. He says he's unsure about the collar and which logo was used (Boston or Bruins), but the uniform apparently looks a little something like this. At least it's not yellow, right? If anyone happened to record the game on NESN, perhaps you can send a screengrab my way so I can post it here. 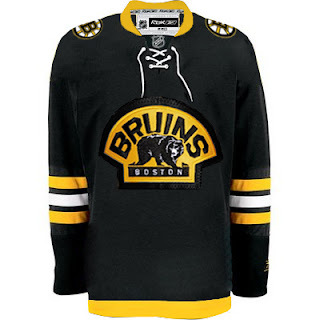 In the meantime, this appears to be a decent possibility for a Bruins alternate jersey for the fall. I'll post more as I find out. UPDATE (2/29 4:33 AM): Got one more concept for the Bruins' new third from a reader, based on the NESN broadcast. Check it out. I'll post more as I get it. UPDATE (2/29 2:20 PM): Turns out someone did record last night's Bruins game and now there's video posted on YouTube. See the third jersey finalists for yourself right here. UPDATE (5/4 8:13 PM): Because I'm slow I just realized that video above has been removed from YouTube. If anyone knows where another copy might be available, please let me know so I can embed a new link. In any event, someone was smart enough to grab freeze frames from the clip before it disappeared. It's better seeing the video, but what can you do? At least you're getting a glimpse of what might be.